Daily Illuminator: Conspiracies & Brains!!! May 31, 2017: Conspiracies & Brains!!! One of our goals is to keep the best-selling games in our catalogs always available. We hate when we watch as aftermarket prices spike (much less skyrocket) over the suggested retail price, so, where possible, we reprint games to be sure you're getting them without chasing them down on eBay. It isn't always in our power to keep games in stock - because of sales volume, licensing restrictions, or larger secrets we cannot share - but, when we can, we push that big reprint button. Fortunately, the reprint button works most of the time . 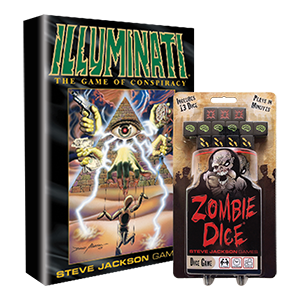 . . so we're happy to announce that both Illuminati and Zombie Dice are back in stock at our fulfillment warehouse. Both have been unavailable for a little while (Zombie Dice ran out back in January; we're sorry), so the last week has seen our partners at PSI shipping out the games as Ross kept chalking up orders. How many orders? Well, Ross sold so many Zombie Dice that we pushed the reprint button again and expect the next batch in September. Question: Is there an Amazon Dash button for Zombie Dice reprints? We may need one.